The CDC has just released a Health Disparities and Inequalities Report with new numbers detailing the uneven mortality and morbidity in the U.S. Family Inequality‘s Philip Cohen highlighted the data on pre-term birth among whites, blacks, Asians/Pacific Islanders, Hispanics, and some Hispanic subgroups. It’s nice to see data that includes more than just whites and blacks; studies often do not report data on Hispanics, Asian/Pacific Islanders, and especially American Indians because the number of respondents is considered too low (and they do not over sample these groups). More, breaking out the different Hispanic sub-groups is also rare. As Cohen said, it’d be nice to see such detail for other groups as well (though it’s tough to do so for black Americans because those who arrived in the slave trade have often lost track of their national/ethnic origin). In any case, the data both confirm previous findings and offer an important insight. In the confirmatory case, it shows that Asians and whites are less likely to give birth to pre-term babies than other groups, with blacks suffering the worst outcomes. As for the interesting finding: notice the wide range of outcomes for Hispanics of different origin. Reporting only “All Hispanic” hides important variation. We can be assured that that variation is true for the other racial groups as well. Wouldn't it stand to reason that if whites were broken out into sub-groups based on origin there would be variations as well? Whites are no more a monolithic group than Hispanics are. Nor are Asians or blacks, for that matter. "...for black Americans because those who arrived in the slave trade have often lost track of their national/ethnic origin..."
What a bizarre phrasing. Sounds like a bunch of Africans came over on slave ships in some vague capacity (not necessarily by force), then, through their own negligence misplaced this vital information about origins. They are able to do this because the data come from birth certificates, not a survey, so they have a 100% sample. And incidentally, the OMB requires all federal agencies to report data by race/ethnicity using specific categories, including "Native Hawaiian and Other Pacific Islander" and "Other Asian." The health risks and profiles for Pacific Islanders are completely different from other Asian groups, and they do have birth data by country of origin for Asians (including Chinese, Japanese, and Vietnamese, as well as Pacific Islanders.) I agree that there's no reason not to collect similarly detailed data for whites, as Northern and Southern Europeans, not to mention Jews, have distinct health profiles. But in the case of whites, I think this is just due to whiteness being the default condition and all the other races/ethnicities being "others". "(though it’s tough to do so for black Americans because those who arrived in the slave trade have often lost track of their national/ethnic origin)." There is certainly wide variation in national/ethnic origin among the white population, and very few studies that track it, mostly on hereditary diseases. Most white people whose ancestors came here in the period when slaves were still being imported do not know the national origins of their ancestors, and many whose ancestors came much later don't, either. On top of that, most African-Americans who are slave descendants have some white ancestry. The differences in prematurity are much more likely to have to do with nutritional status, smoking, and availability of prenatal care than ethnicity. 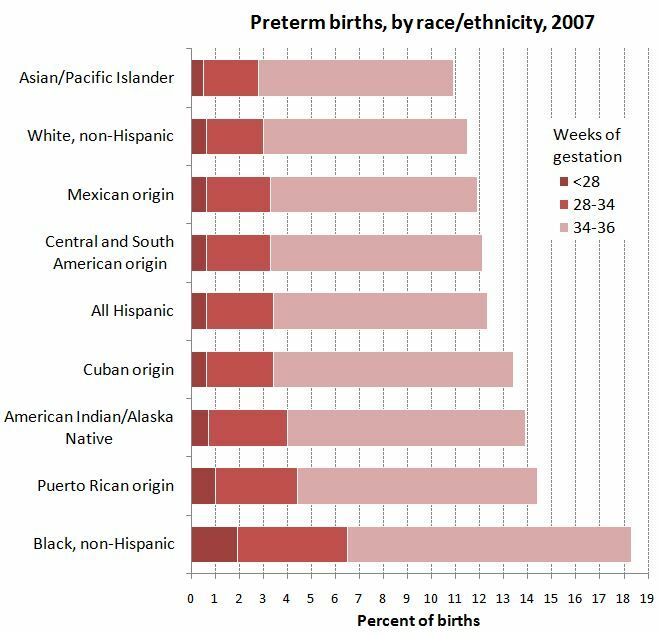 For example, prematurity rates are lower in Cuba than in the US, and there appears to be no significant difference between races. Focusing on breakdowns by ethnicity rather than SES, access to health-care, and other variables can obscure first-order causality. He/she might be trying to say that many "White" people are actually descendants of African slaves who also lost their national origins. Many mulatto blacks, when able to, separated themselves from their darker family members a long time ago in order to have better lives in America. I, myself, have "White" family members who are listed as "Black" by choice. These comments are ignoring or seriously underplaying that Slaves and descendants were "robbed" of their history.Families were separated, names changed, records destroyed,etc. Many American Blacks don't even know their Real family names! To compare Black Americans ability to trace their origins to Whites is ridiculous. I wonder if the findings of blacks having the largest number of pre-term babies is related to perhaps surveying a larger number of younger mothers? Do they cover the ages of the people surveyed? It's interesting data, but I agree with whoever it was that said that there are rather too many confounding factors here. I was thinking, it's quite a good example of how our prior assumptions can affect the meaning we attach to raw data, actually - someone with a certain set of assumptions might well say "this difference is most likely due to genetic differences - it demonstrates that women of certain races are more likely to give birth after a shorter gestational period than others, and we just think of this as premature because all of our data is based on white women". Another might say (more judgmentally) "this difference is most probably because women of certain races tend to ignore the good medical advice they are given, so they are likely to smoke and engage in other risky behaviours during pregnancy and therefore their babies are born prematurely". A third might say (and I suspect that this is what Lisa intended it to illustrate, and what most readers including myself would agree with) "this graph shows that women of certain races are marginalised by American society, and as a result of this they are more likely to give birth prematurely or have other negative outcomes to their pregnancies". The data itself shows none of those things, but could easily be used to illustrate any of them (and perhaps a few others I haven't thought of). Data from the Office of Minority Health shows that SES, education and even smoking do not explain the racial disparity. Even when stratefied by all of these things, black infants still have higher risk of mortality than white infants. Hispanics of different nationalities fall between these two extremes. There is something going on that the CDC cannot quantify, yet will suggest: racism. Yes, it is interesting to get the details on how nationality affects the results for Hispanic infants. It would also be interesting if they showed the data for infants born to African-born and Caribbean-born parents. You always see non-Hispanic black, as if that is the only thing a black person could be, if they are not Hispanic and black. But I imagine, if culture and a history of discrimination play a role in the data, that black infants born to parents themselves born in Africa or in the English-speaking Caribbean may have differing results, due to not growing up in America. It's because of vitamin D. Dark skinned people form less vitamin D from the same sun exposure. Even among a variety of mums in sunny southern California, vitamin D significantly decreased the occurrence of preterm babies as well as the related problems. I can't find the study but here's an article about it http://www.telegraph.co.uk/health/healthnews/7656620/Large-dose-of-vitamin-D-in-pregnancy-cuts-premature-births-research.html Most researchers I know are now advocating to EVERYONE 5000IU of vitamin D per day, though they encourage testing to see how far you are from the best levels (instead of the 'normal' levels which are too low.) That's 125μg, more than the women in that study received. I wonder how much of the high infant mortality of black infants is due to lack of vitamin D and perhaps some other nutrients that aren't provided in America, that they would have received in ample amounts in Africa. Probably just the vitamin D, but you never know.